Following Jasper Cillessen’s move to mighty Barcelona, young 20-year-old Cameroonia, Andre Onana was presented with an opportunity to stake a quick claim at number one spot at Dutch giants Ajax. 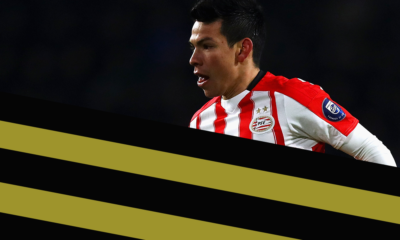 Though Tim Krul’s signing potentially presents a different thought-process among the management, Onana has given a welcoming headache for boss Peter Bosz. Onana started the 2016-17 season in the Jupiler League with Ajax’ second team, before being called up to first team duties. 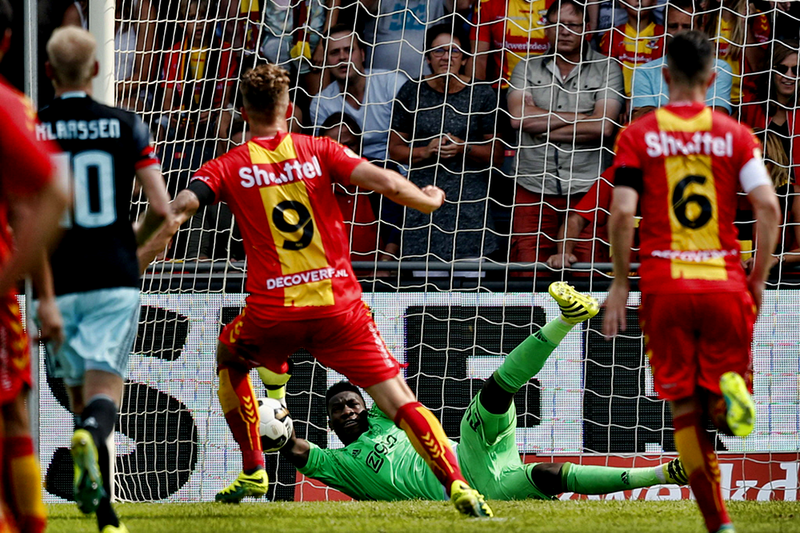 As debuts go, there have been fewer ones that were so vastly on two different ends of the spectrum; Onana announced himself with an excellent penalty save in his first game but the side ultimately succumbed to lowly Go Ahead Eagles. But what has followed since has the potential to keep currently injured Tim Krul out of the squad for a prolonged period of time. Onana has overseen three consecutive clean-sheets as Ajax recovered their season, while also making his European debut in the 2-1 win over Panathanaikos. Though still raw and rather inexperienced, Onana’s fearlessness is bound to aid his first team stint. Competition from Krul will only further heighten his potential, and we hope the youngster manages to hold his spot in these rankings. Sergio Rico’s place in Sevilla’s starting XI looked confirmed after impressive showings last season. But the signing of Salvatore Sirigu in the summer has built competition for the youngster, with manager Jorge Sampaoli often rotating the two. But the game time he has been given, Sergio Rico has accepted with open arms. He has kept three cleansheets this season, including impressing away in Turin against Juventus in the Champions League. Cleansheets away to Villarreal and more recently in the derby against Real Betis have further cemented his place and eased the wounds left from the eight conceded against Real Madrid in the European Super Cup and Barcelona in the Spanish Super Cup. Despite conceding four against Espanyol on the opening day, he did pull off some decent saves to ensure the 6-4 scoreline was not further bizarre. Though some feel rotation with Sirigu only hampers Sergio Rico’s potential growth, one can argue it only ensures a higher level of performance from the Seville native. 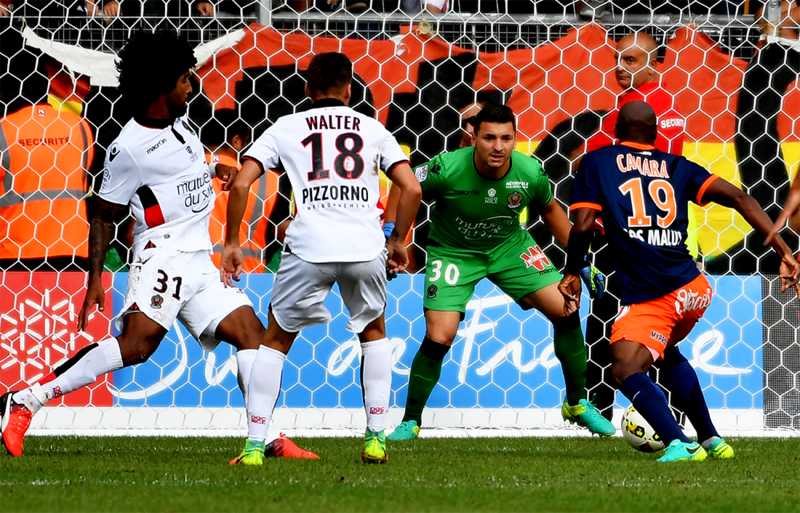 Having got his big break in the 2015-16 season, starting the season on the bench with the team before ending it with 25 appearances in the starting line-up, Nice’s Yoan Cardinale has now well established himself as the number one choice for the current leaders of the French Ligue 1. Cardinale started the early games of the season with back-to-back clean sheets, while impressing in the subsequent games as well despite conceding, Cardinale’s best performance came when his Nice side faced fellow unbeaten, AS Monaco at the Allianz Riviera. He saw his side score four past the opposition, but the 22-year-old himself was called upon seven times throughout the game, a challenge he responded to well as he looked to ensure his third clean sheet of the season (at the time of writing). With the experience of Paul Baysse and Dante ahead of him, along with the excellent Lucien Favre in the dugout who did oversee the development of current Barcelona keeper – Marc Andre ter Stegen, Cardinale is in good hands and will unsurprisingly be a regular feature in subsequent versions of the Talent Radar Rankings. 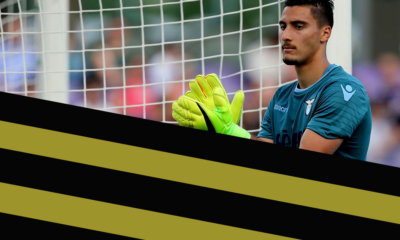 The last time a teenage goalkeeper named Gianluigi played first-team football, he went on to become arguably the greatest goalkeeper of the generation. The current Gianluigi in question, has started a year earlier, but as brightly as the great before him. Since making his debut 11 months back, the youngster has appeared in every single league games for the Milan giants. He started this season with a stoppage time penalty save, denying Andrea Belotti a hat-trick and ensuring all three points for the home side. Disappointment followed in the next two league games, but sandwiched in between was a national team debut for the 17-year-old as he played 45 minutes for Italy against France. His best performance came recently in a 2-0 win over Lazio, which was also his first cleansheet at home in the 2016-17 campaign. 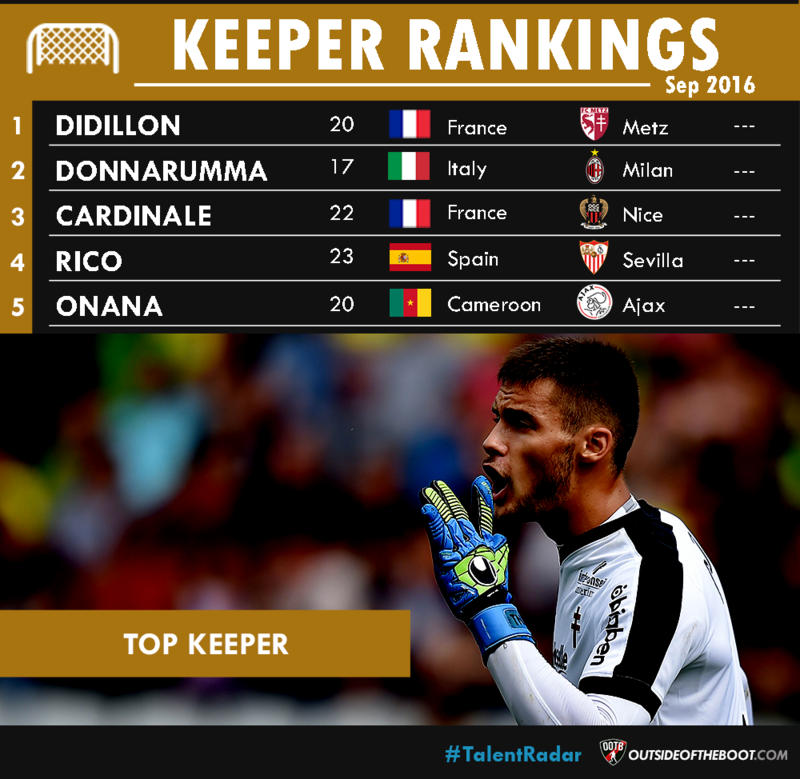 Talent Radar Accolades: Gianluigi Donnarumma was the winner of the Debutant of the Season award at the 2015-16 Talent Radar Awards, and was also named in the Talent Radar Serie A Team of the Season 2015-16. The teenager was also named in our 100 to Watch in 2016 feature. 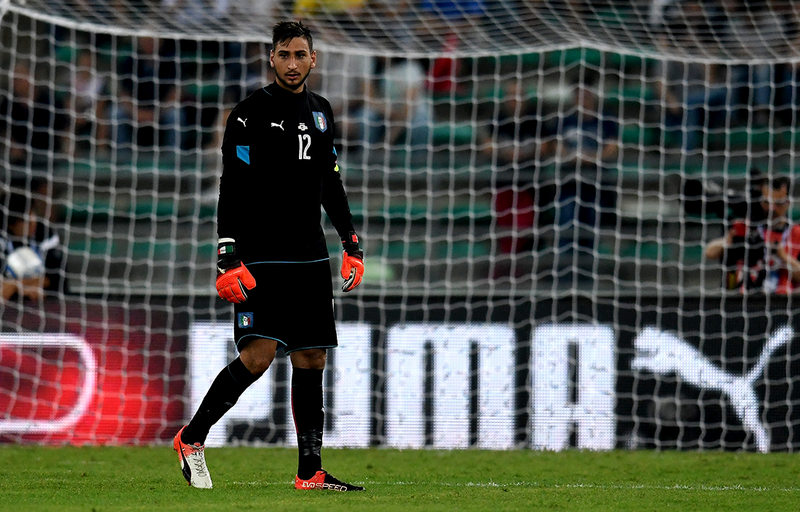 You can read a Scout Report on Donnarumma here. 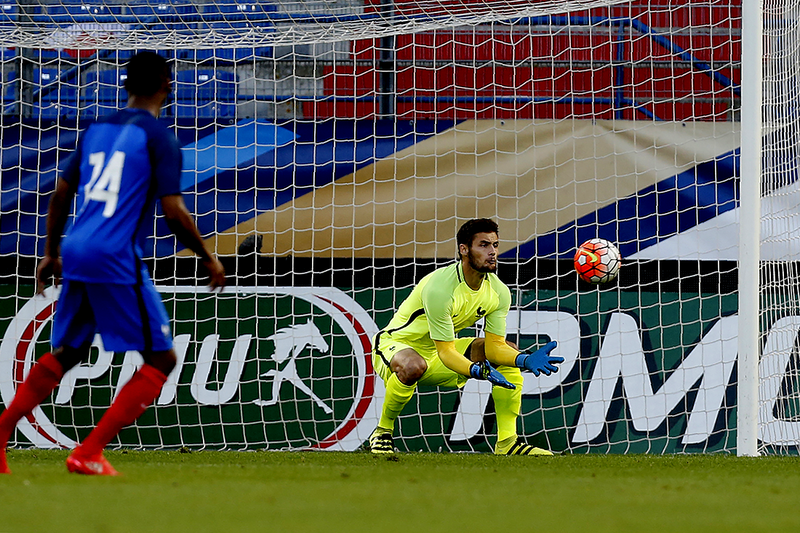 Having been promoted with FC Metz as the first choice keeper, there was no surprise when 20-year-old Thomas Didillon kept his place as starting goalkeeper in Ligue 1. Having impressed with thirteen cleansheets in twenty seven appearances in the second division, Didillon has taken to the first division in similar fashion, and finds himself atop our rankings. The youngster has already managed three cleansheets in six games thus far this season, with his two best performances coming against Dijon and Angers. Against the former, he managed seven saves including one from the spot while another seven saves followed against the latter. It’s never easy for a youngster to impress in top flight football, but to do so with promoted side deserves it’s own recognition. 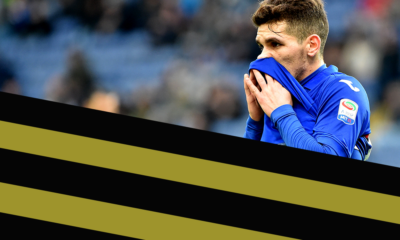 The shame is that Metz as a side may not be able to compete against stronger opposition, hampering Didillon’s performance and potentially his place in these rankings; but the Frenchman has handled the pressure immensely thus far.